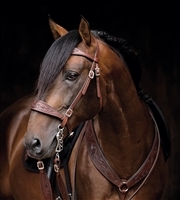 We carry a wide range of horse bits and bitless options - everything a horse and rider needs! Includes pelham bits, free ring, eggbutt, dogbone, D ring snaffle bits, and nosebands and chin straps for your hackamore set up! Myler Bits Full Cheek with Hooks MB02 4 3/4"